What makes K-12 public school educators choose to use a museum as part of their curriculum? Amber Geary welcomes a group of students to the Wellin Museum of Art at Hamilton College. Photo by Janelle Rodriguez. In 2013, I became the Museum Educator for the Wellin Museum of Art at Hamilton College, a 200-year-old Liberal Arts college nestled in the foothills of Central New York. 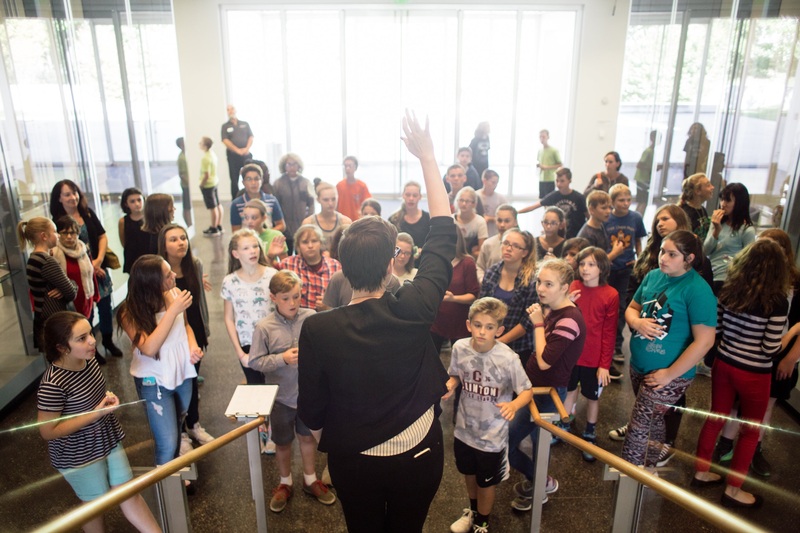 I was excited to welcome the throngs of eager K–12 school groups to the Wellin’s newly constructed halls, as the museum was barely a year old when I joined the team. I was thrilled to be working with a comprehensive permanent collection, alongside cutting-edge contemporary exhibitions that rotated bi-annually. 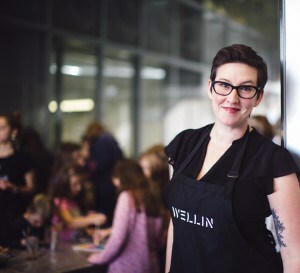 The Wellin has a sign on its front door that reads, “Free and Open to Everyone,” and this is a philosophy we apply to everything, including customized public school tours. I won’t say I thought it was going to be easy—after all, we were the new kid on the block—but I did think that the cards were stacked in our favor to hit the ground running. Middle school students viewing pieces of the Wellin Museum of Art at Hamilton College’s permanent collection during a tour at the museum. Photo by John Bentham. It was soon apparent that my sense of ease was misplaced. Teachers were not banging on our doors, even when we sent professionally printed direct mail pieces and hand-signed letters. My phone didn’t ring off the hook after I made presentations in faculty meetings at regional schools and handed out free pencils imprinted with our logo. I was doing everything “right” in my mind but there was very little return. I came to museum education via a path that included art education and over a decade of marketing and branding consultation. In my experience, the No. 1 way to find out what your client wants is simply to ask them, so that became my new goal. Through a research grant from the Andrew W. Mellon Foundation, I conducted a two-year, mixed-method, regional study that posed the question, “What makes teachers choose to use a museum as part of their curriculum?” For the purposes of this study, the phrase “use a museum” refers to museum-school collaborations that are virtual, in-school or in-museum. The study employed focus groups, online questionnaires, and personal interviews of public school teachers and administrators working in the three counties surrounding the Wellin, within a radius of approximately fifty miles. The research also included the perspectives of four peer institutions on the dynamic between museums and public schools. When the research topic was developed, there were no regional or national studies that explored the dynamic of museum-school collaborations following the implementation of the Common Core State Standards Initiative in 2014. With the introduction of the Common Core, public school teachers and administrators experienced a shift in not only their curriculum but also in the priority of experiences that could compliment this new curriculum. In October 2014, The Art Newspaper cited that “The traditional museum field trip is threatened because of the Common Core States Standards Initiative, which seeks to make students more competitive in the global job market by emphasizing problem-solving [and] overly rote learning. . . . In a 2012 survey, 66% of US teachers said that other subjects, including the arts, were being ‘crowded out’ with extra attention being paid to Math and English.” Our study sought to understand the motivations of teachers to use a museum as part of their curriculum, and more specifically, their motivations to use a museum in a Common Core learning environment. According to our study conducted at the Wellin Museum, 95% of respondents reported finding value in using a museum as part of their curriculum. However, the research also showed that 41% of respondents had never done so. The study, which began as an investigation of motivations, became instead a study of the barriers that prevent teachers from engaging in a museum-school partnership. As my research progressed, three barrier “themes” became apparent. These themes shed light on the discrepancy between those educators finding value in the museum-school collaboration and those actually participating in such an arrangement. The theme of Time refers to time away from the classroom to take a field trip, including travel time, and interruption of testing schedules. The theme of Cost refers to the cost of bussing for a field trip, substitute teachers to cover classes while the teacher is away on a field trip, and museum admission and programming. The theme of Defensibility refers to the need for the teacher to defend their choice to partner in a museum-school collaboration to their supervising administrator. Issues like curricular tie-in and administrator buy-in factor heavily here. When considering the issues of Time, Cost, or Defensibility, one must look at the goals of a museum-school partnership through the eyes of a teacher or administrator. If the American school system judges student success (and therefore, the success of the teacher, or school district) by a test score, then all activities tied to curriculum must reinforce students’ ability to perform well on tests. While not every district interviewed for this research placed sole emphasis on test scores, it is ever a consideration. Curricular tie-in and reasonable costs (or those able to be planned for well in advance) increase the possibilities for successful museum-school relationships. This idea carries over to teacher professional development offerings as well. It was reported that the issues of Time and Cost are less important than the scaffolding provided by museum programming, as it relates to what students are learning in the classroom, and how educators present that material. The paramount importance of curricular tie-in is good news for museum educators because we absolutely DO offer what teachers and administrators are looking for. Museums have the “primary documents” teachers are being asked to use to illustrate concepts in the classroom, covering every wall and on view in every vitrine. Of course, not every museum’s permanent collection and exhibitions relate to every type of Common Core module, but we all have something from which we can make viable connections. It should be noted that the burden of responsibility is on the part of the museum to create and communicate their Common-Core-friendly offerings requiring that museum educators become fluent in the language used in the modules of the Common Core. It was suggested by both teachers and administrators that a “Menu of Offerings” that tie into classroom topics would be a valuable tool. This would also relieve the burden on teachers to create a museum-school collaboration and would make the barriers of Time and Defensibility less prohibitory issues. The importance of Common Core tie-in is exemplified by the four peer institutions that were interviewed as part of the study. There were mixed reports of the impact from the implementation of the Common Core on their respective museum-school collaboration’s success. This is likely due to the method of delivery of their message. It seemed that the institutions with the most success in creating and maintaining museum-school collaborations developed ways of showing the tie-ins to the curriculum, in the “language” of the Common Core. This includes Venn diagrams outlining museum offerings and how they overlap with curricular goals, and letters written to teachers in a specific discipline detailing offerings that applied directly to material taught in the classroom. For some peer institutions, the Common Core felt like an improvement due to the effortless pairing of the amenities of museum programming and the new tenets set forth in the Common Core. The results were overwhelmingly clear that I, along with other museum educators across the country, need to refocus the way we present our offerings in a way that speaks directly to the needs of public school educators. While we can’t always control Time or Cost, speaking the language of public school teachers and administrators could solve the barrier of Defensibility, and that can make all the difference. Amber Geary is the Museum Educator and Docent Program Supervisor at the Wellin Museum. Joining the museum in 2013, Amber created and presently supervises the K–12 and community education program, as well as the Hamilton College student docent program at the museum. Geary recently concluded a two-year qualitative research project funded by the Andrew. W. Mellon Foundation that focused on the relationship between public school educators and museum education programs. With a background in both marketing and art education, Amber believes that art benefits the study of every subject, at every level of learning. Geary holds a B.F.A. in Visual Communications from Cazenovia College and an M.S. in Art Education (K–12) from Syracuse University. See more of the Wellin Museum on their website, Facebook, Instagram, Twitter, and YouTube. Interesting and helpful study. It seems like the increasing use of “pop up” exhibits that are portable address the pressures of cost and thus permissions needed for schools. Virtual exhibits coupled with such also allows for a longer term integration into curricula over a number of subjects that could then widen the experience and take it from K>gray going from preschools thru senior citizen programs and drive more opportunities for different types of visits to the museum. It could promote a program such as “take a grandchild” to an exhibit for fun and as part of a larger educational experience.